My desire and need to raise money in order to attend Daniel Smith’s trial vs the DoJ (FDA) in Spokane has kindled actions that, for me, have been long overdue. Instead of the standard, “please send me money” routine (although it will always be appreciated), I have something that I feel is of value to send you in exchange. 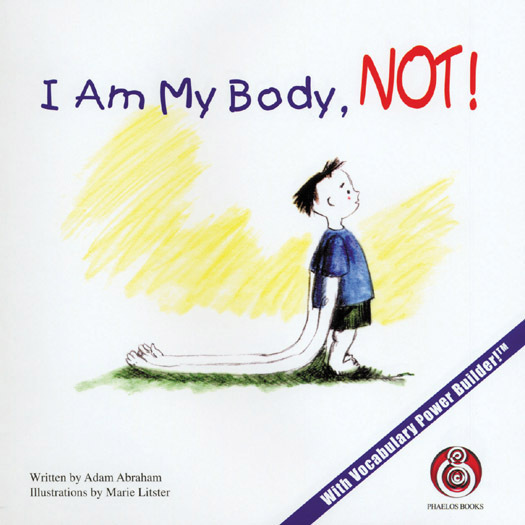 On rare occasions I have mentioned my book, which is titled, I Am My Body, NOT!, but the site where it was available, which I’ve had since 1997, had been hacked and quarantined by Google. I have tried to resolve the problem and remove the code, but so far have not succeeded. While this book is intended for everyone, parents and grandparents tend to resonate with it most, as it presents some pretty deep subjects about life in a very human and compassionate way. I created a Shopify site that has the product on it, and is accessible from within Facebook, where the book, and another product that I developed some years ago, can be purchased. I have about 800 copies sitting nearby, that have been waiting their time. I will also sign each one, as these are high quality, First Edition prints, whose value will climb. Here’s a new video on the book. 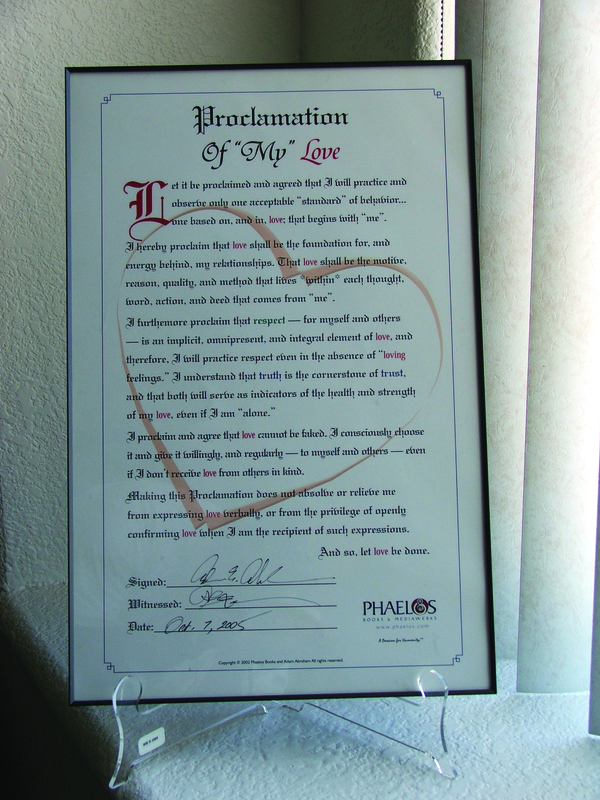 I created Love Proclamations in 2002, but did not promote or publicize them. The idea of the “proclamation” is that it’s a public statement, you could say of intent, around which agreement is possible, and even desirable. 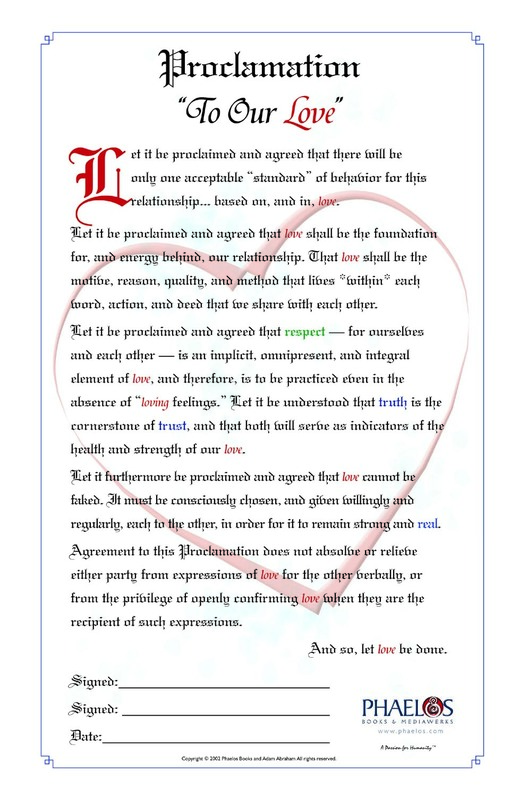 In this case it is a proclamation that describes standards by which loving relationship is conducted. It is signed by the party or parties involved. 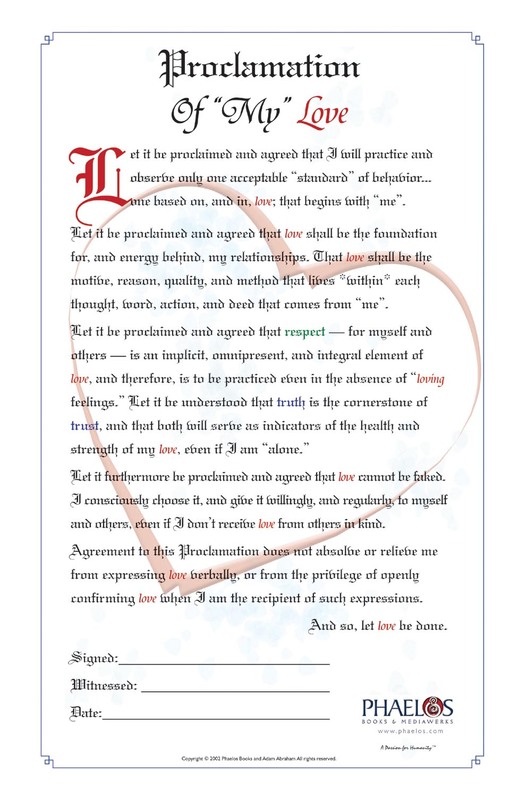 Love Proclamation: “To Our Love” — a conscious foundation of, and for, relationship. The Love Proclamations, which are printed on high quality broadsheet (11 x 17) paper come in two flavors, distinguished by context. To Our Love — a relationship between any two people on personal, in business, or any other combination that might apply. To My Love — defines the foundation of relationship with one’s self. You can now purchase Love Proclamations, along with I Am My Body, NOT! at the Phaelos Books & Mediawerks store. I see great value in these thoughts, particularly in placing them in a nice frame and hanging them on the wall for visitors to see. This is something for everyone, because quality of relationship is what defines the quality of our lives, and relationships go better, and are healthier, with love. Of course, I stand the risk of few people seeing the value that I see in this, but that should not be my concern. I have more to share, including a t-shirt that I designed and launched a campaign on teespring.com. However, it’s different from any of the one’s that I mentioned earlier (of course). This iconographic image is inspired by the do it yourself, or “DIY”. 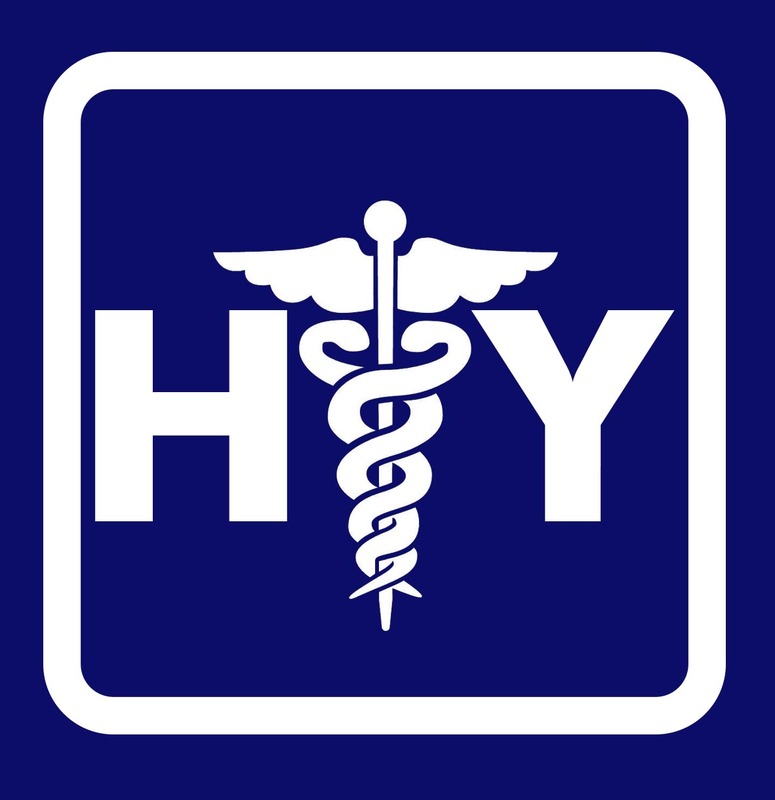 The “H” and “Y” are for heal and yourself. The caduceus in the middle could be seen as a substitute for the word “it,” or simply understood as the Kundalini energy that can potentially well up within each of us. Heal Yourself, What a Concept! For the past few months there has been major changes in my relationship with the makers of the Rainmaker H2O water transformation technology, which necessitated a realignment of said relationship (love waned for some, and waxed for others), and me stopping accepting orders, as I had customers (including several resellers), but no product for them to buy. So the no income situation had become more acute. But that is changing too. 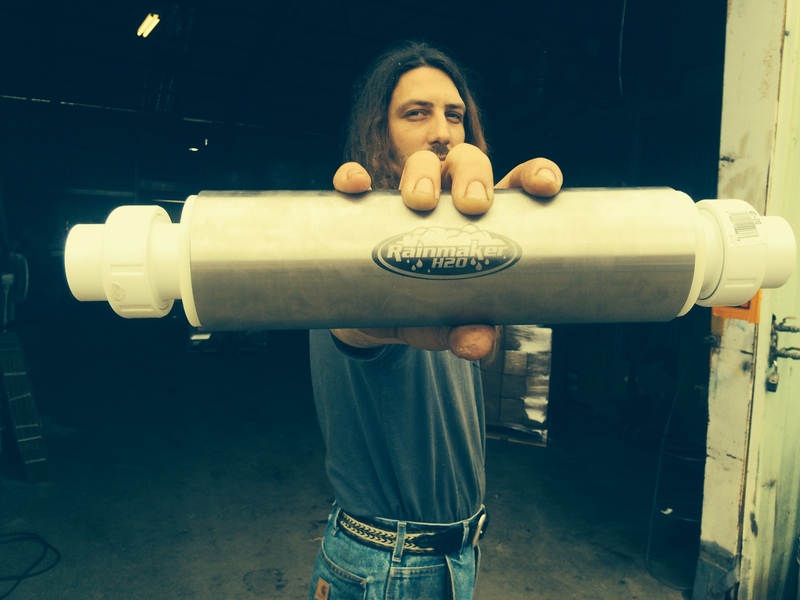 This is a picture of a reborn Rainmaker H2O unit, with new geometry inside, new materials, and manufacturing processes. This one is for a 1″ or 3/4″ line, which typically goes on a home. The man holding the unit is Joseph Johnson, who I met 5 years ago in California, and has taught me much about the microbial part of life. He will oversee manufacturing the product, I will market it, and others that will follow. This was not my intention or vision when I first came across water. I attempted to step away at one time, but several people who valued our relationship wouldn’t allow it. To think of what I wouldn’t know and appreciate had they not cared, boggles the mind. The more I have learned, the more I see where amazingly wonderful change can occur, needs to occur, must occur. It doesn’t end with the device that Joseph is holding. It begins there. I have several more t-shirt designs, but need to stop, pack my bags, load the car, and hit the road for a meeting in Colorado tomorrow. Yes, please test the system out. If there are any glitches, let me know directly and I’ll fix them right away. I also have a reseller in Australia, who has been waiting for me to get product again, that you will be able to work with directly. I suspect that after we get product moving again, I’ll be traveling to your part of the world to be with the many friends that I’ve made over the past few years. 300mm is just under 12 inches. I will speak with Joseph and get back with you. We may, or may not have to fit the entire line size to achieve the results we’ve been seeing. On the road for now, but we’ll chat soon.